Movie Ramble: Free Men (Des hommes libres). Free Men (Des hommes libres). Occupied Paris 1942. Like many fellow Algerian’s Younes has come to the city to find work and locate his cousin Ali who is a union agitator and a resistance fighter. 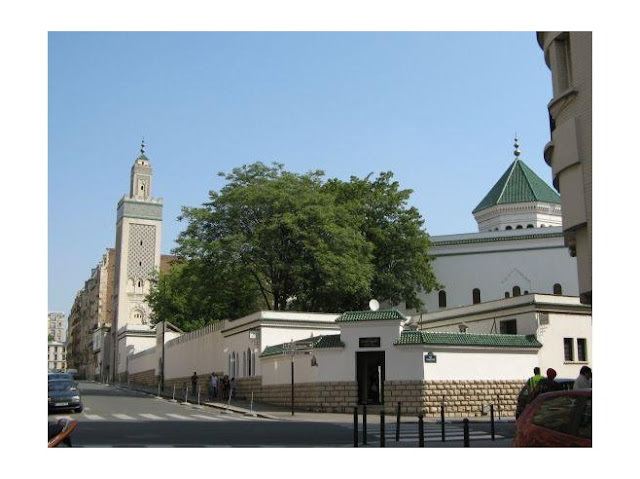 When the French police arrest him for black market activities they offer him a way to stay out of prison by spying on Si Kaddour Ben Ghabrit the rector of Paris’s Great Mosque. The authorities suspect that the Mosque and its rector are providing false identity papers for Jews and on some occasions hiding people in the cellars below the main building. At the Mosque Younes meets a young good-looking singer Salim, who turns out to be Jewish and Leila a committed communist. Both of who help to change Younes outlook on life and consequently persuade him to not only renounces his undercover work for the police but to play a greater part in the resistance. The French actor of Algerian origin, Tahar Rahim best known for his role as Malik El Djebena in the 2009 award-winning French movie A Prophet, plays Younes, with well-known veteran French actor Michael Lonsdale, who played another religious figure in Of Gods and Men (2010) to great effect, as the rector. French-Moroccan film director Ismael Ferroukhi mixes fact and fiction to tell this thought provoking but little known story of the Paris Mosque that supplied North African Jews with forged Muslim identification papers under the long noses of the Gestapo. Like two similar films before it, Days of Glory (2006) and Outside the Law (2010) it gave false hope to the Algerians that fought along side the French against the Germans during World War 2 for independence from French colonial rule, something they had to fight their until 1962.